Very exciting! Do you know how long the study will run for? These little icons are so sweet! Sounds really interesting, but… do you know why Test Pilot / Feedback is not compatible with 8.0+ versions (nightly channel) ? Your thoughts about new tab are really great! I would like to see most of those variations in Firefox. – Frecency could find his way to Home tab. – Most recently bookmarked sites are already available in the not-very-tydied-up bookmarks menu. In my opinion it would be good to make a panorama group into a bookmark group. -predictive new tab is best for new tab. You could also add suggestions for search querys. Pierre: I’ve got an update to Test Pilot/Feedback coming out soon (before the study is launched!) which will fix the compatibility problem. I love the fact that you at Mozilla are researching this seriously instead of just throwing it in like most others have done. What is vital, which I’m sure you’re aware of, is that this fancy new tab page loads instantly. As fast as a blank page, or faster 😉 This happens to be one of my biggest beefs with Chrome. The new tab page there feels sluggish, while Fx on the same computer opens new tabs instantly. Also, I really like the fact that you’ve arrived at using the favicons instead of minitures of the rendered websites. We are much more trained to quickly identify sites based on favicons, from using tabs and bookmarks. 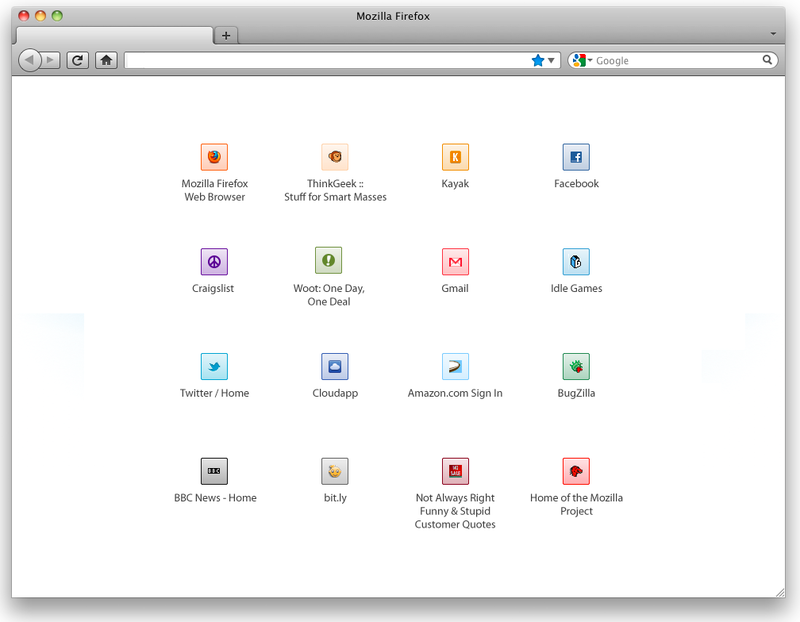 Also, favicons will be lighter and quicker to load and display than website thumbnails. OT: BTW, what is this comment system/plugin you use? I’ll definitely participate, although, the first options seem the most obvious for me already. That’s a actually 4×4 grid, not 8×8. Having used Predictive NewTab already, all I can say is that I’m not at all impressed. The suggested sites are too close to the last active tab. When I open a new tab, I am usually navigating to something different, not to the same sites I was reading. One thing to look out for is to make sure that Firefox is better at reading users’ minds than they are at reading their minds. The task, of knowing where you want to go next, seems *way* easier for the human user to do than the computer to do. So you want to complement the user’s intelligence, not try to replace it. That also suggests interactivity is key–letting the user customize, tune, or otherwise interact with the suggestions.